When deciding upon summer travel destinations, you might consider some of the most beautiful and exotic places in the world. Thousands of years of history, unique attractions and picturesque scenery are but some of the reasons visitors venture to these locations year after year. Explore the possibilities. The Philippine province of Suriagao del Dur lies on the eastern coast. The Tinuay-an Falls in the city of Bislig is one of the main attractions in the tropical location. Cascading waters fall 180 feet (55 meters) and span 312 feet (95 meters) in width. The Hinatuan Enchanted River located in Brgy is also a sight to see. Locals believe fairies created the stunning sapphire and jade colors of the water. In 2010, a team of divers discovered a subterranean cave beneath the river. Many come to Surigao for the thrill of surfing in Cantilan or Lanuza. The South Asian island of Sri Lanka lies in the Indian Ocean. Spectacular terrain, stunning beaches, ancient cities and local culture are some of the many reasons visitors come here. The beautiful coastline in Kikkaduwa is renowned for surfing, snorkeling and scuba diving. The Dambulla Cave Temple is a wonder to behold. Within five caves, visitors encounter an array of colorful statues representing different gods and goddesses. The Pinnawala Elephant Orphanage rescues and cares for the largest herd of pachyderms on the planet. Guests delight in having the chance to interact with the animals. The modern Southeast Asian metropolis is found on the southern tip of Malaysia. The Botanic Gardens are a wonderful place when in need of peaceful surroundings. Three distinct areas feature sculptures, a museum, orchid gardens, a bonsai garden, a healing garden, a rain forest and Swan Lake. Learn more about local religious culture by visiting the Buddha Tooth Relic Temple & Museum, the Sri Mariamman Temple or the Sultan Mosque. Treat your taste buds to tantalizing local cuisine in the street vendor markets. Along with being the capital of the Emirate of Dubai, the Persian Gulf municipality boasts thousands of years of history and culture. Dubai features unique attractions and upscale shopping opportunities. Stroll along the winding pathways of the Al Fahidi Historical Neighborhood. Join heritage tours or visit a mosque. The Dubai Mall has more than 1,000 stores and restaurants along with an ice rink, indoor waterfall, aquarium and zoo. The Palm Jumeirah remains the largest manmade island in the world. The unique palm tree shape of the structure fascinates locals and guests alike. The tropical location in the north Atlantic Ocean remains one of the most popular summer travel destinations. Pink sandy beaches create the island’s perimeter, which is bordered by clear blue ocean water. Coral reefs and shipwrecks are entertaining underwater sights for divers and snorkelers. However, the Royal Naval Dockyard is most often frequented for the chance to see the Bermuda Aquarium, Museum and Zoo. Other points of interest include the Masterworks Museum of Bermuda Art and the Crystal Caves. The New Zealand west coastal community of Punakaiki is where the unusual Pancake Rocks are found. The formations were created by eroding limestone when the ocean broke through blowholes during high tide. The extreme pressure on hard and soft limestone layers evolved into the unique pancake-like configurations. The popular destination features pathways, which meander through the formations along with stairs carved into the rock. Visitors also enjoy watching the dolphins which frequent local waters. The Tahitian island is naturally surrounded by a barrier reef and a lagoon. The extinct volcanoes Mount Otemanu and Mount Pahia rise from the heart of Bora Bora. Accommodations in all budget levels typically feature bungalows constructed over the clear ocean water. Scuba diving and snorkeling are some of the most popular activities, as the waters are home to various species of manta rays, sharks and tropical fish. Take a segway tour of Vaitape or hike to the peak of Mount Otemanu. Visit the nearby islands by boat tour or kayak. The city lies along the southern coast of Rio de Janeiro and features clear waters, waterfalls and pristine beaches, which offer the chance to enjoy a variety of water sports including diving, fishing, skiing and surfing. The 18-kilometer Contour Highway traverses from the city center through rainforests, along beaches to bars and inns. Local dishes often feature fresh salmon and shellfish combined with olives, onions and spices. Barbecues are also popular and are created using poultry or red meat. When Englishman Edward James arrived there in 1949, he desired to create a personal Garden of Eden in the jungle. 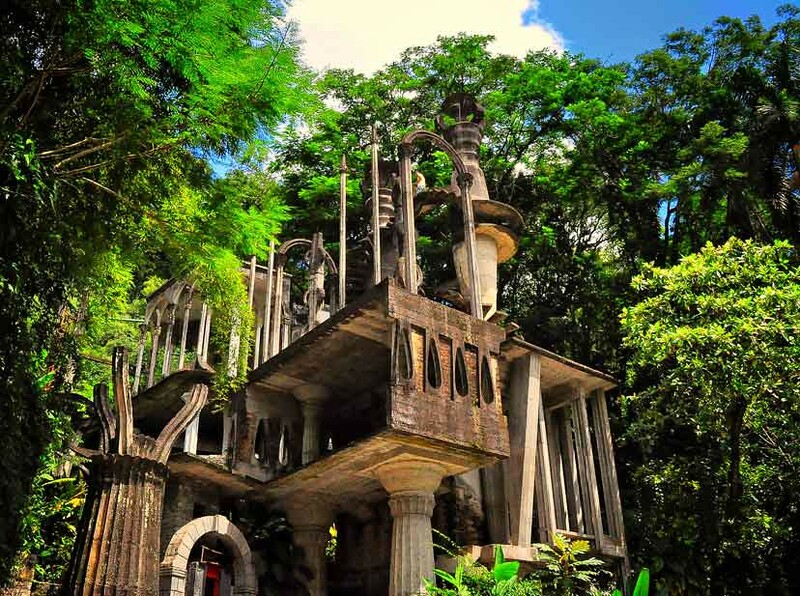 For the next 35 years, he constructed a castle, small homes and Surrealist sculptures from concrete on 80 acres (32 hectares) of rainforest land. The site also included orchid gardens, pools and waterfalls. Today, guests are entranced while making their way up and down steps, ramps and walkways through the gardens and sculptures, which rise up to four stories in height. Dean’s Blue Hole descends approximately 663 feet (203 meters) into the depths of the ocean. Seahorses, tarpon and turtles frequent the water here along with divers who enjoy exploring the underwater caves. On the surface, one side of the salt-water pool features a powder soft, white sandy beach. It’s a great destination for water sports enthusiasts. The many summer unique travel destinations found around the world might make it hard for vacationers to decide upon one location. However, wherever you go, you are bound to encounter amazing sights, welcoming locals and an abundance of local cuisine options. Once you arrive at your chosen vacation spot, you are destined to make memories to last a lifetime. Why Cape Town has fast become the most sought after travel destination in the world? Previous articleWhy Visit Goa in Summers? Phoenix Hutton is a travel blogger and photographer. She had a fulfilling 7-year career as a flight attendant before choosing this path. She felt like even though she was always travelling, she didn’t get the change to explore and learn more about the countries she was visiting. She has her own project, called LuxuryTravel where she writes about various luxurious destinations and activities.